Our twice monthly Sunday Public Run Days find rideable steam, diesel and electric trains operating on eight acres of scale tracks. While our Track Plan Page details the layout of our two railroads, only a personal visit, and the smiles of visiting children and adults alike, really explain what LILS is all about. Enjoy your on-line visit. But, mark your calendar now for an in person visit, and then climb aboard to enjoy the sights, sounds, smells, and excitement of Live Steam Railroading right here in your Long Island backyard! And if you like what you see when you visit, you might consider joining the Long Island Live Steamers. Check out our Membership Page for more details. See you out here soon! LONG ISLAND LIVE STEAMERS, INC. was founded in 1966 to preserve the fine art of precision steam model making. While our outdoor tracks, and the trains that run on them, may represent our most visible activity, our members also build scale model steam boilers, engines, boats, and tractors, as well as fully functional railroad models. Very few of our members are professional machinists, most are hobbyists, some have small basement shops, while others have no shops or projects. The uniting interest lies in steam power, railroads, and having fun. The club site is located in Southaven (Suffolk) County Park, which is near William Floyd Parkway and Sunrise Highway. The county has made available about 8.5 acres of land on which our railroad operates. We have a recently expanded elevated railroad (known as the High Line) for 3/4″ and 1″ scale trains with more than 1250′ track and a 4600′ right of way for 1 1/2″ scale trains (known as our Ground Line). 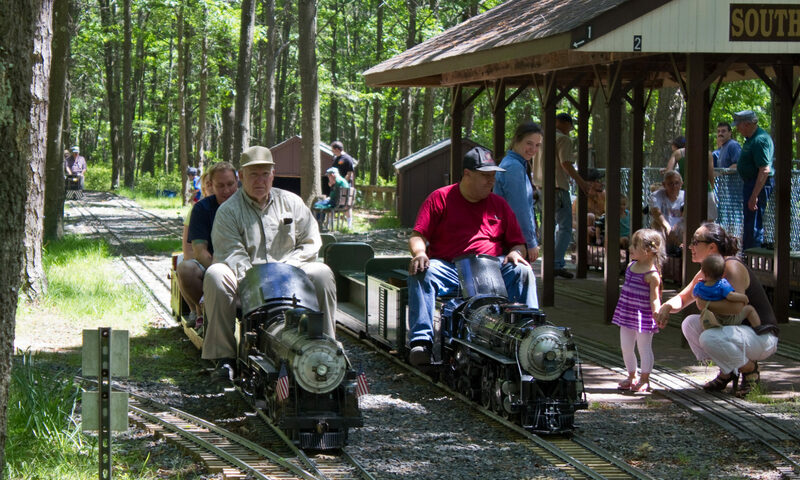 In fulfillment of the public trust use of park land, Long Island Live Steamers hosts visitor rides on our Public Run Days scheduled for the second and last Sundays of each month from the middle of May through the end of October. The engines and rolling stock you will enjoy on any given Public Run Day can be a mixture of member owned and club owned equipment. But on Meet Days, members of other Railroading Clubs throughout the country bring their consists along to run on our tracks. So, while a single visit to Long Island Live Steamers can be a huge amount of outdoor and nostalgic fun, regular visits are practically mandatory for complete enjoyment of what LILS has to offer. Better yet, a membership gives you a great excuse and special access to come and be part of railroad history and remembrance on a regular basis. We believe that we have one of the finest tracks in the country (we are only a little bit prejudiced!) and if you would like to join us as a member, check out our Membership Page, or better yet, come down to the park on a Run Day or any other scheduled event and submit your application in person. We welcome your participation in our club.